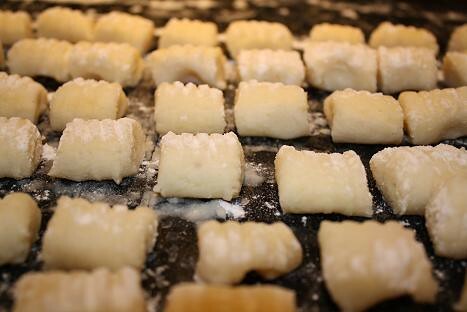 Gnocchi is arguably as difficult to make as it is to pronounce. 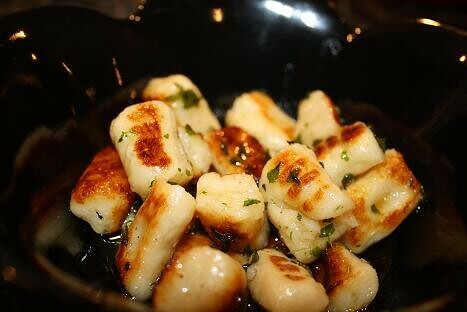 I’ve been a fan of gnocchi for some time now. However, I have heard over and over again how difficult it is to successfully make this potato pasta light and fluffy. After this week, I see how this is not an endeavor for the fainthearted, but fear not my friends, you can do it! I started out the week anticipating that I would be attempting this dish, so I found three totally different recipes at the beginning of the week. Then it wasn’t until Thursday that I had built up the courage to actually attempt one of them. My first attempt was a recipe from a trusted source – Cooks Illustrated. I’m not going to lie, my first attempt was a total failure. I have to admit that one issue was that I didn’t have a potato ricer, and I’d read that a grater with large holes worked just as well so I thought I’d use a grater instead…must be user error, because it was very messy and I couldn’t get all of the potato grated without burning my hands. I do have to say though that the recipe I tried didn’t have any egg in it. I felt that it really needed something to bind it together as I was rolling out the dough and it kept falling apart. This is where I stopped, threw the dough away, and tried to forget this experience. It took me two more days to work up the nerve to try another recipe. This time around it was a recipe called “How to Cook Gnocchi Like an Italian Grandmother” from a great website I frequent called 101 Cookbooks. I figured that an Italian Grandmother should know what she’s talking about, so I pumped myself up and tried again. Attempt number two can be considered a success. This time around, I bought a cheap potato ricer, and it was a fabulous decision. It helped me to get the potatoes light and fluffy without having chunks of potato mixed in. Plus the ricer made the process fast, which ensured that the potato got riced while it was still hot. Another difference was that I boiled the potatoes rather than baking them as I did in attempt one, and this made peeling the potatoes a dream. Also, there was one egg in the dough and about 1/4 to 1/2 cup less flour than the first attempt, which made the dough a lot easier to work with. The end result was a gnocchi that was lighter than the often dense store bought gnocchi tends to be and was delicious. Click here to see step by step instructions for this recipe. My final attempt was using a recipe from one of my go-to chefs, Giada de Laurentiis. There were two big differences between this recipe and the last: First, the potato cooking method was to nuke the potatoes in the microwave, cutting down the cooking time drastically. Second, the recipe yielded about half the amount as the 101 Cookbooks recipe. I made a few of alterations from the recipe. The instructions say to mash the potatoes with a fork, but I liked the texture from the potato ricer, so I riced the potatoes instead. Also, I added the salt, pepper, egg, and flour to the potatoes all at once and mixed it on the counter. The biggest change I made was to saute the gnocchi, rather than boiling it as the recipe calls for. My absolute favorite gnocchi dish had sauteed gnocchi in it, and I was anxious to try out that method, and I have to say that it worked beautifully. I loved the end result from Giada’s gnocchi! I would begin with Giada’s recipe, but instead of microwaving the potatoes, I would use the boiling method used by Heidi at 101 Cookbooks to make peeling them much easier. Once the potatoes are cooked throughout, I would quickly rice the potatoes while they are hot. (If you don’t have a potato ricer, I think it’s worth the $8 to $20 to purchase one.) 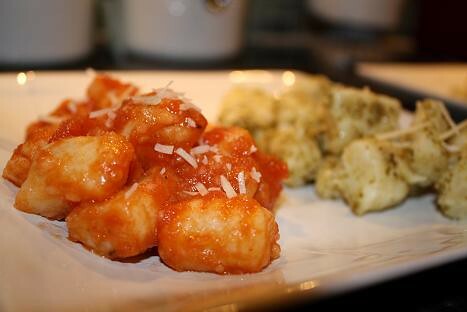 To add flavor to the oftentimes bland gnocchi, I would saute the little gems and then would toss it with a spicy marinara sauce that I used in attempt 2 and top it with a bit of freshly grated cheese. Now that would be perfection!! Nicole, I'll have to try her recipe out sometime, too. You should definitely try Giada's recipe. The dough had great flavor, and the recipe didn't make an amount that could feed an army, which was nice. Let me know how it turns out for you!